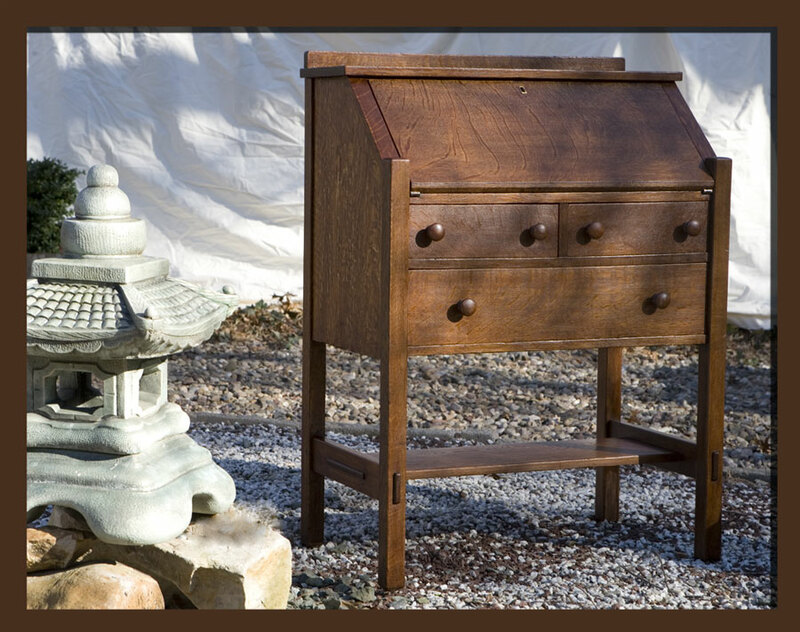 "Golden Oak" - perhaps the best known of the machine made mass-produced American furniture of the early 20th Century. 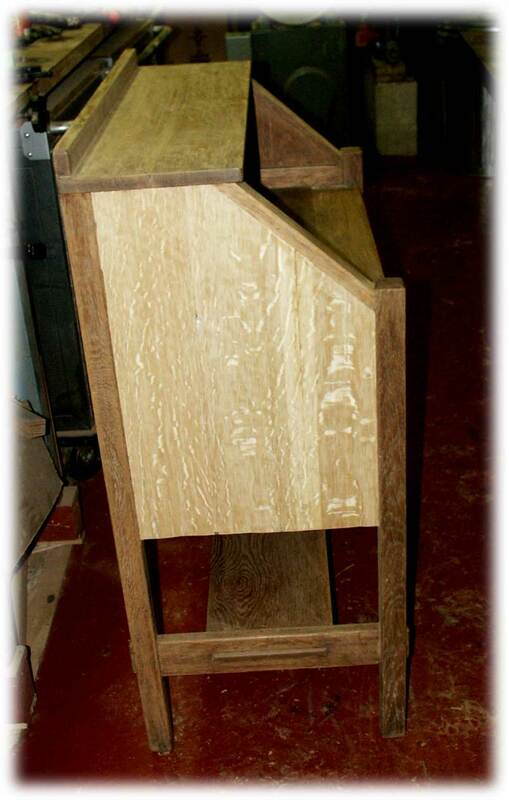 Designed as office and home furniture, these pieces feature a trademark quarter sawn oak in solid or veneer. 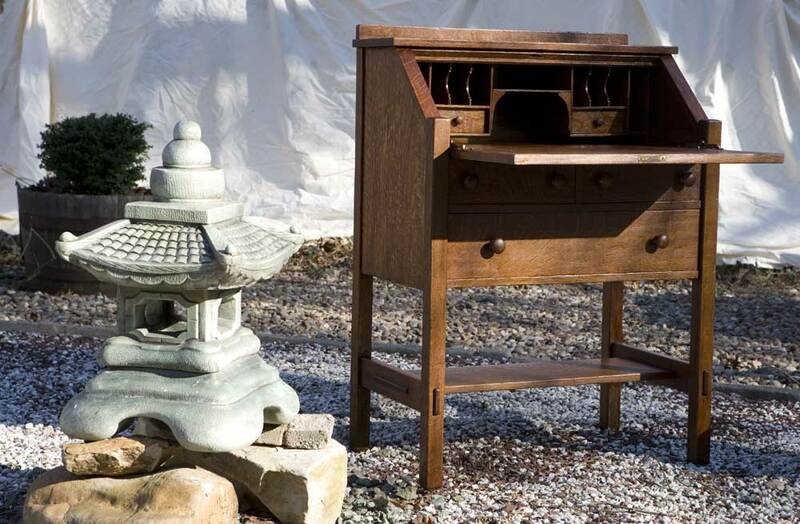 Obsessively well made, these pieces survived generations of the worst-case furniture abuse known … and are now breaking records with their selling prices today. 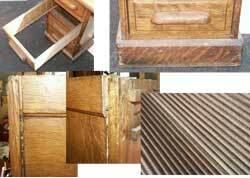 This Stickley secretary arrived in a condition not suitable for function or display. The piece was apparently at one time painted pink, why? We have no idea why, but whomever did this should themselves be painted pink. 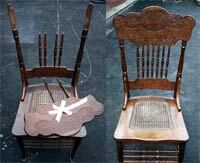 The piece was fully restored, including new veneer on one side that was damaged to severely to repair. 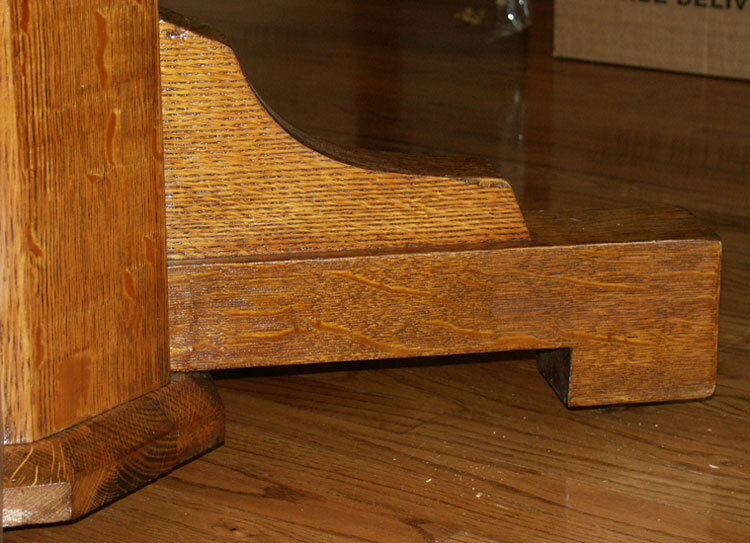 True to Stickley's form, the piece is mortis and tenon joints with pegs and most of the structural sections were intact. 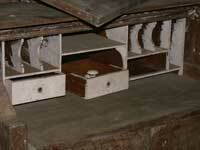 The pink was removed, the remaining veneer restored, and the various components were repaired and reinstalled. 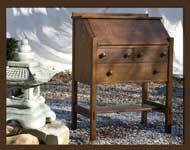 Shown left, quarter sawn oak, a restored golden oak tabletop. Amazingly even Stanley used many of these old pieces as scrap wood through the 60’s … we’re taking a wild guess at about $50,000 worth. 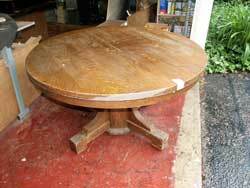 Did you throw out a set in the 50’s or 60’s … you tossed out a $15,000 dining set, a $4,000 desk, or perhaps a $5,000 glass door cabinet? … well if you have one left they are a restoration dream. 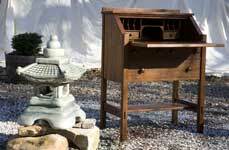 These pieces restore beautifully and face no restrictions how methods and finishes as do true antiques. We love to work on any of these pieces: desks, bedroom sets, dining sets, office furniture, etc. 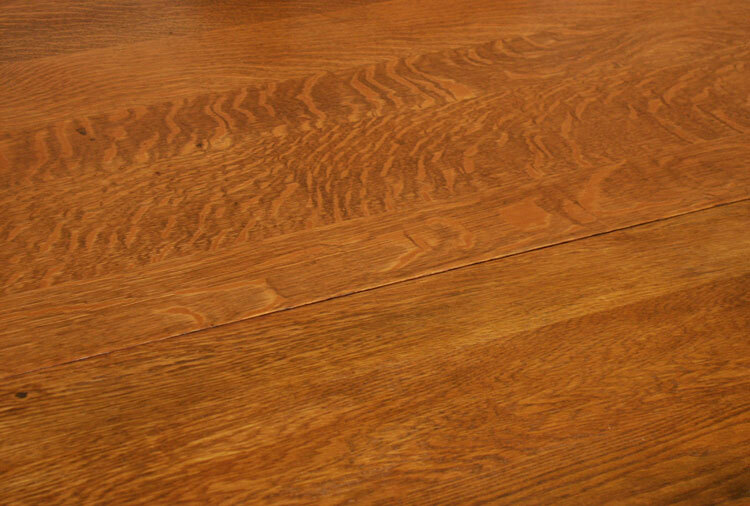 Golden Oak is a perfect medium to restore to it’s former beauty - only now it posses the richness of antique patina. 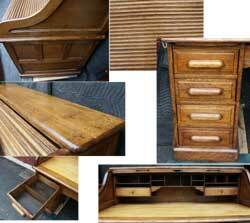 Our Golden Oak restoration gallery is rapidly expanding, these are are a just few recent pieces in our portfolio. 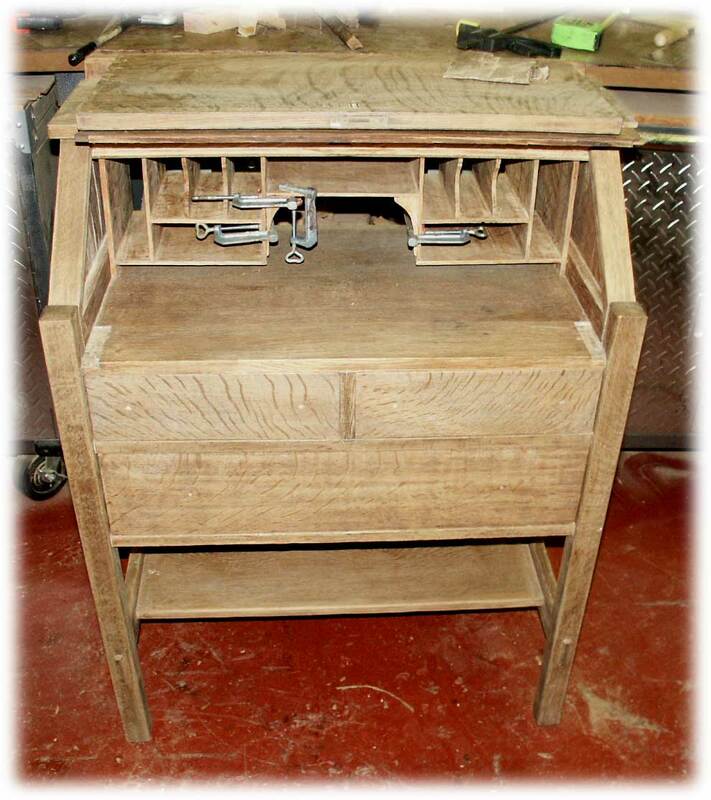 Eric's first golden oak restoration, another roll top, was "pre" digital camera - and Artisans completed multiple desks over the years. This "S Roll top" provides a perfect example of a classic office desk of the early 20th century. 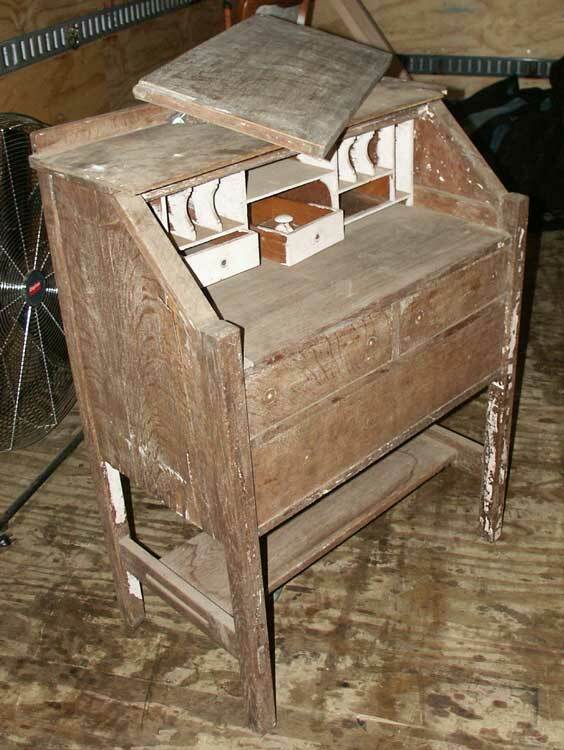 In addition, a dining table, a set of chairs, and repair work on a lawyer’s cabinet are shown. 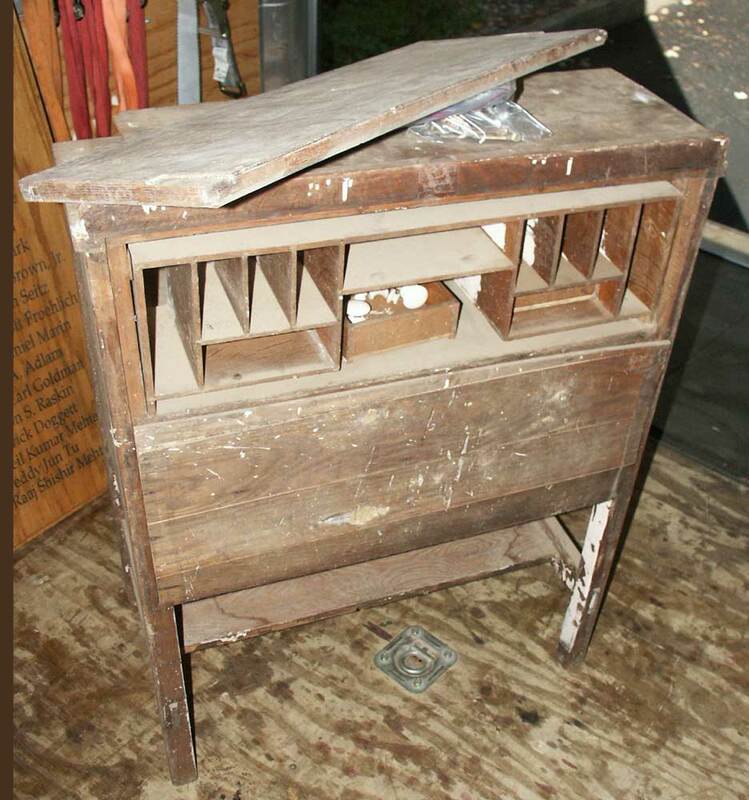 This desk above was a basement storage item for quite a while. Standard - water damage on the base, missing drawer bottoms, joint work separating from deteriorated Hyde glue, sagging cubbies, etc. They all come in about the same! 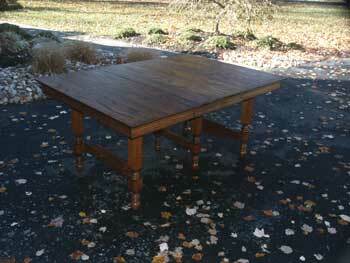 This golden oak table arrived fresh from basement storage - a common place for pieces of this era. Pull them out - they all look the same they have black water damage on the areas touching the basement floors and walls. Let’s see; the veneer is peeling in many areas - it’s double layer veneer the stuff took amazing abuse before it reached this point! The pieces are usually dirty and some covered with a bit of mold - but you hang on to them because they were your mothers or grandparents. 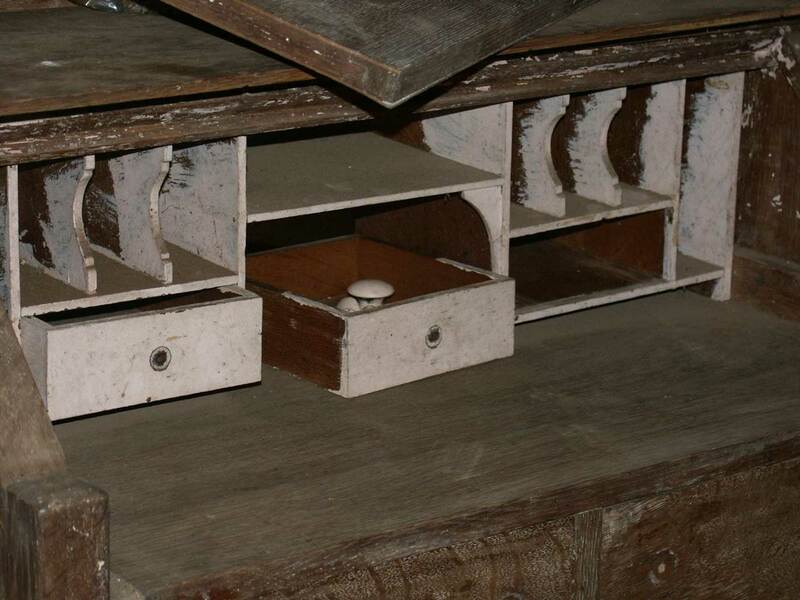 It’s time to restore these pieces and give them place in your home worthy of well-made furniture. This table top is simply hiding it's beauty, it's not a loss by any means! 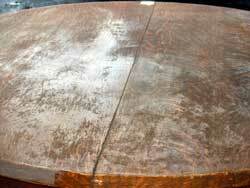 Shown in progress, the tabletop is chemically treated to remove the old finish without destroying the antique patina. 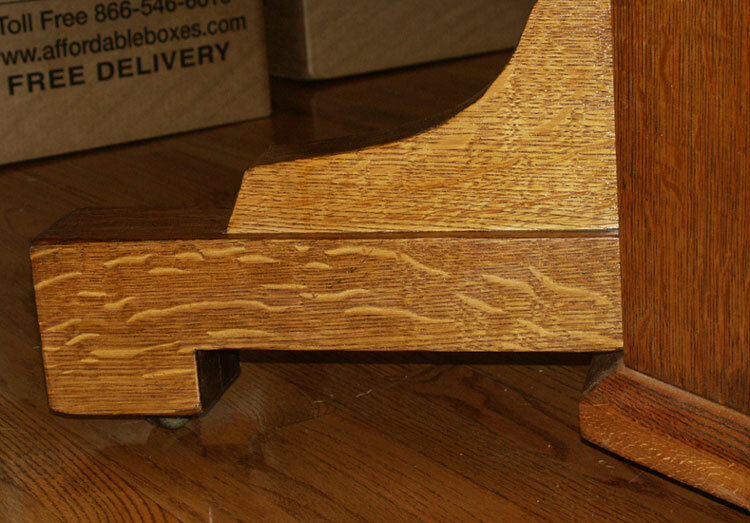 Then lightly sanded to smooth the raised grain and bring the patina where it would accept a golden oak tinting. This table provides a perfect example for a before and after scenario. 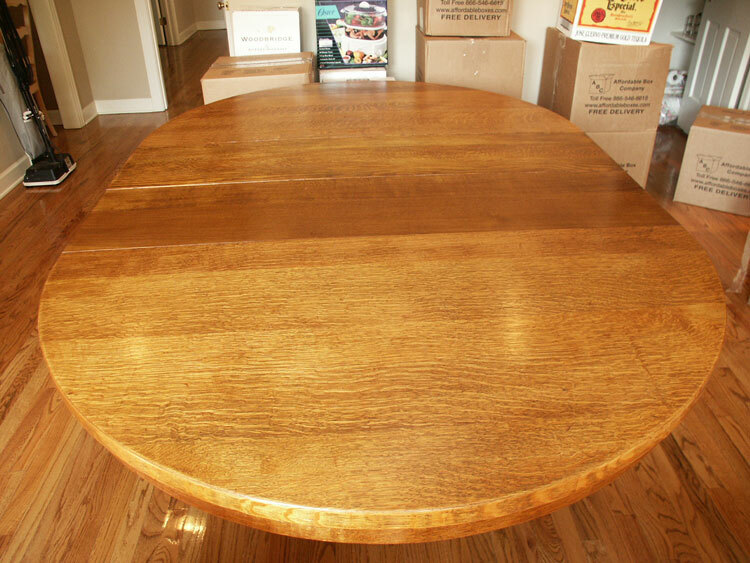 Disassembled, cleaned, old layers of finish removed without attacking the aging of the oak surface, veneer repaired, and then finally assembled and refinished. Clients are always amazed with their first golden oak restoration - they have no idea how much intricate beauty the quarter-sawn oak offers when properly finished. Restoring this take brought back a piece worth between $1,500 and $2,500 … not bad for a basement find. 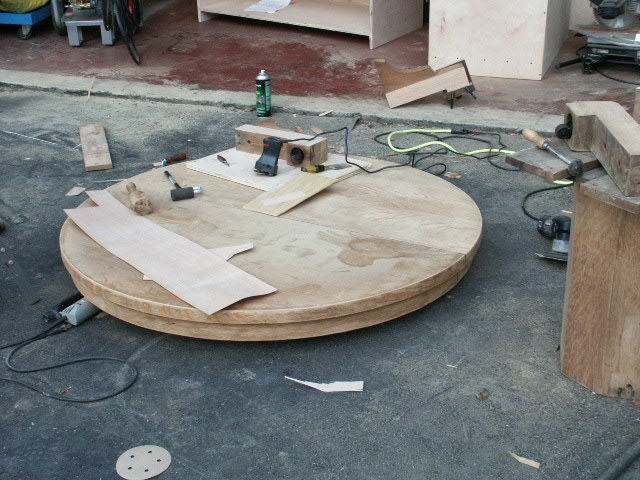 We even added a set of leaves, including the the quarter sawn apron, and the table is now complete. 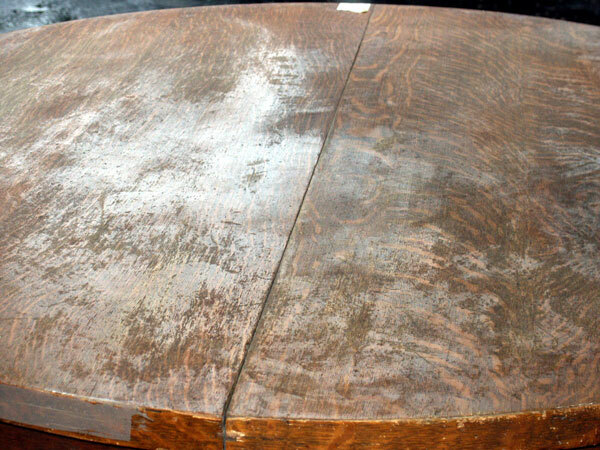 Tables from this era are often simplistic, but commonly included ball-and-claw feet, extensive, carving, and other detail. 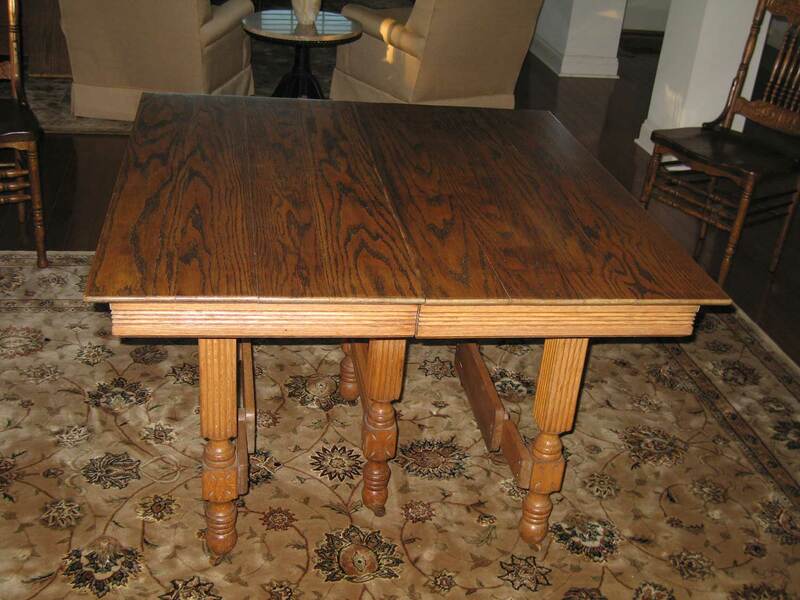 We can repair any damage to carving, including replacing broken toes or whole feet on these tables. 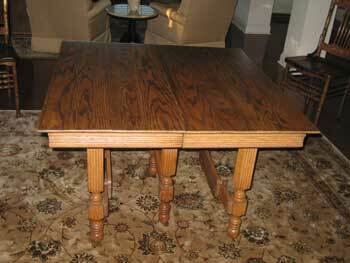 A table with a missing toe is significantly less value than one with a complete foot. 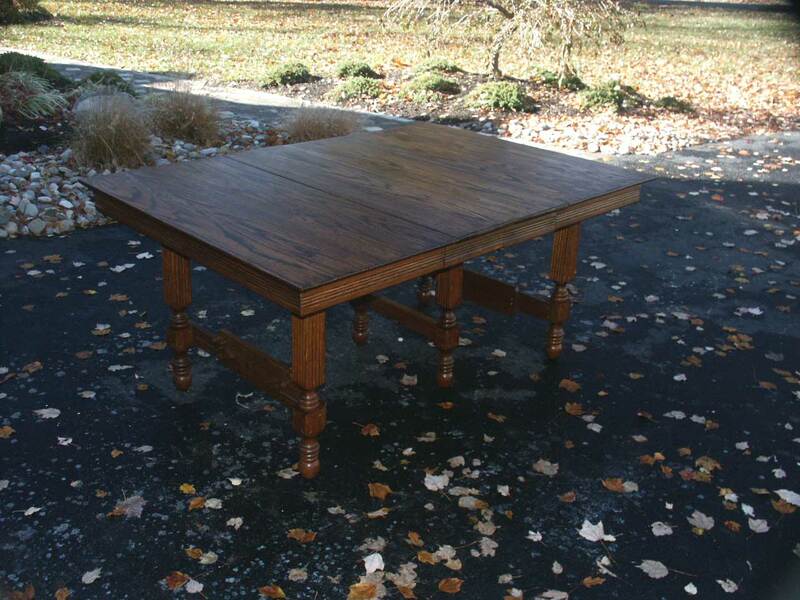 This six leg oak table required disassembly, including the whole tabletop. Leaves were existing, but did not posses the apron. A custom bit was cut to duplicate the exact profile of the apron for the leaves. 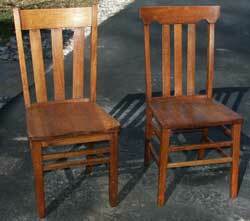 The piece was also refinished, a few shades darker, to match a set of oak chairs. Chairs are a very popular restoration item, often broken as well as requiring attention to the finish. The chair shown was part of a set of four Golden Oak chairs, this one badly damaged and in need of replacement spindles. 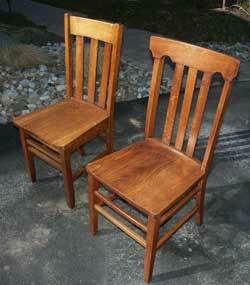 We turned two new spindles, reassembled the chair, and restored the finish on all four. The wood of these chairs was extremely dry, by carefully applying natural oil and finishes we reanimated the oak and returned a good percentage of the chairs weight and strength. 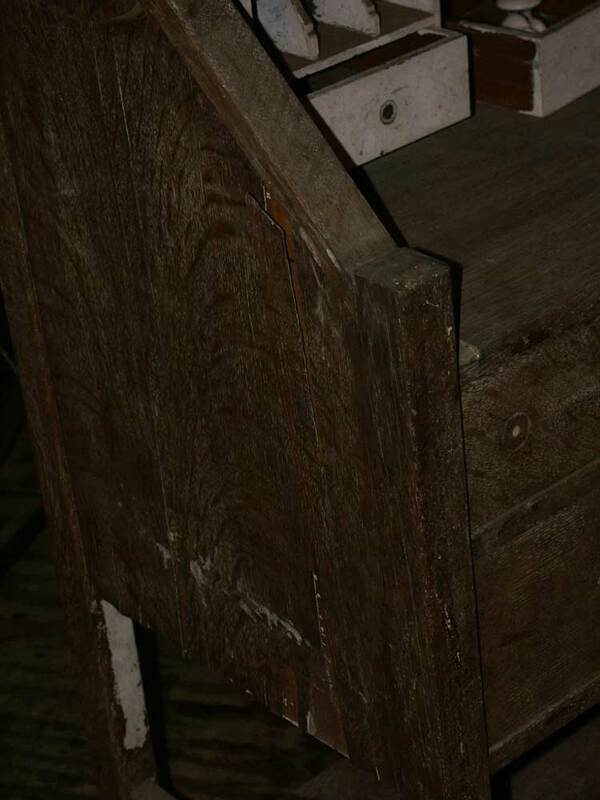 The project also included removing various nails, wood filler, and other previous inappropriate attempts at repair before completing the proper steps. Less formal and more fun, this set of children's play chairs are perfect for kids, dolls, bears, or anything requiring a scaled down seat. 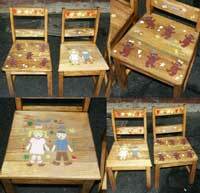 These chairs were found in the ruins of a fire and brought back as a rustic and creative project completed by Cindy Saperstein (Stan's wife) including the stenciling. These two golden oak chairs arrived unfinished and weak. We disassembled them, rebuilt them, and applied a fresh finish.